A panic-inducing asteroid, catchily named 2012 DA14, will not obliterate all life on Earth when it swings very close by in early 2013 - BUT it might do the next time it pops round. The European Space Agency said today that although the space rock will miss our planet this time, it won't be by much, which goes to show how important it is for folks to be watching the sky. The asteroid is due to whiz by at a distance of just 24,000km, closer than many commercial satellites, and it'll be back again soon. "A preliminary orbit calculation shows that 2012 DA14 has a very Earth-like orbit with a period of 366.24 days, just one more day than our terrestrial year, and it 'jumps' inside and outside of the path of Earth two times per year," said Jaime Nomen, one of the discoverers of the rock. The astroid was spotted by the La Sagra Sky Survey observatory in Spain in February this year. Despite how often 2012 DA14 comes through the neighbourhood, the rock hadn't been seen before because of its relatively small size - 50m - and unusual orbit. "Considering its path in the morning sky, its rather fast angular motion, the quite faint and fading brightness and its orbit high above the plane of Earth’s orbit, it was a slippery target – and easily could have escaped undetected during this Earth visit," Nomen said. As the space rock is relatively small, it's harder to spot, but it could still do some serious damage if it smashed into the Earth. The ESA reckons around half a million undiscovered near-Earth objects of up to 30m across are knocking around out there. "We are developing a system of automated optical telescopes that can detect asteroids just like this one, with the goal of being able spot them at least three weeks before closest approach to Earth," said Detlef Koschny, space scientist in charge of near-Earth objects at ESA’s Space Situational Awareness (SSA) office. Scientists will use next year's pass to study the Earth and Moon's gravitational effects on the rock. "We will also be keen to see the asteroid's resulting orbit after the next close approach in order to compute any future risk of impact," Koschny added. 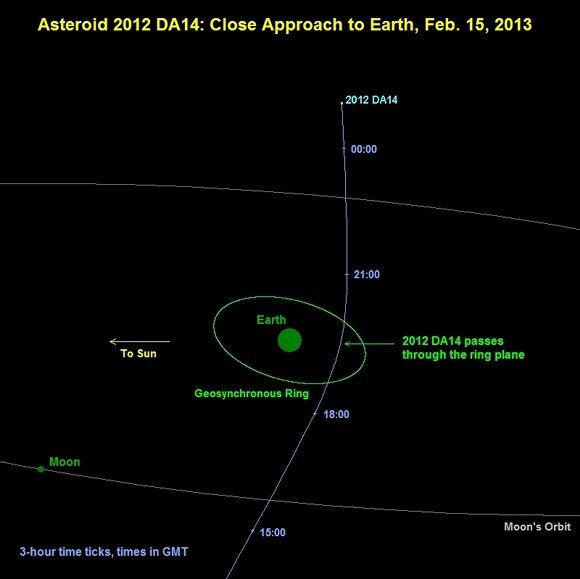 2012 DA14 is going to make its closest Earth approach at around 19.26 GMT on February 15, according to NASA's Near Earth Object Program at the Jet Propulsion Laboratory.